Think of ToneMeter as your emotional spell-check. ToneMeter can identify and flag emotionally charged sentences within your OurFamilyWizard® message. As intuitive as grammar or spell-check, ToneMeter goes beyond sentiment to gauge words and phrases against 8 levels of connotative feeling, allowing the end user to make real-time corrections and adjust the overall tone of messages using an easy-to-use menu system. Sometimes messages are misunderstood because of word choice. ToneMeter gives you the ability to do a quick once-over of your message to prevent you from accidentally saying something that you might regret. ToneMeter analyzes your messages to detect the root emotions of your message, giving you more perspective as to what someone might feel when they receive it. When composing a message using the full version of the website, red bars at the bottom-right corner of your New Message window will alert you that ToneMeter has detected emotionally-charged sentences in your message. Click the orange box near these bars to display ToneMeter's results. If you see no red bars, then ToneMeter has not detected any concerning sentences in your message. Note: Tonemeter is optimized for US English. OurFamilyWizard® has an exclusive partnership with Lymbix. Lymbix has developed some incredible products like ToneCheck™ that incorporate its semantic processing tools. They have spent years to develop linguistic algorithms to better understand how we communicate with each other. From individual users to large corporations, Lymbix's tools are being implemented to help reduce the potential for conflict or misunderstanding. 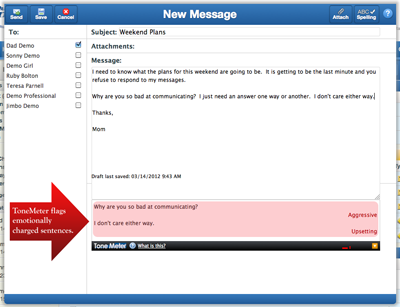 We are proud to add this new optional functionality to the OFW® messaging system. Hopefully, this new tool will help parents avoid conflict by having a better understanding of how their messages are being received.